HealthAid GinkoVital 5000mg helps to maintain healthy blood circulation to the brain and the rest of the body. HealthAid GinkoVital has a high strength formula which is rich in active compounds, flavonoids and terpenoids. GinkoVital is specially formulated using standardised ginkgo biloba extract concentrate with high level of ginkgo flavonoids and terpenoids, which are ginkgo`s primary active components that may help maintain healthy blood circulation. Bullking Agent (Soybean Oil, Vegetable Shortening, Yellow Beeswax), Capsule Shell [Gelling Agent (Gelatine), Humectant (Glycerol, Purified Water), Natural Colours (Cuprick Chlorophyllin, Titanium Dioxide, Black Iron Oxide)], Standardised Ginkgo Biloba Extract, Emulsifier (Unbleached Lecithin). Adults and children over 12 years of age, take 1 capsule a day. Can be increased to 2 Capsules daily if required. Do not exceed the recommended daily intake unless advised by a suitably qualified person. Please seek professional advice before taking this supplement if you are pregnant or on any prescribed medication. 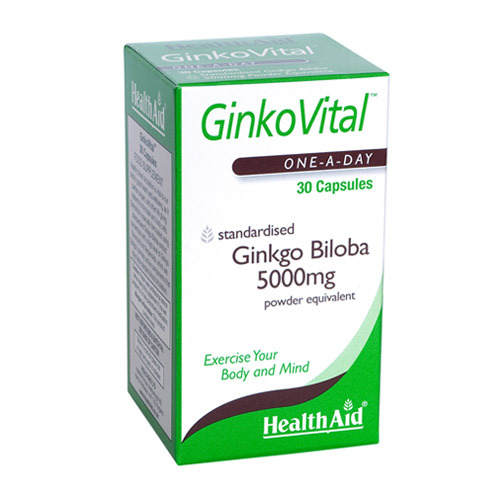 Below are reviews of HealthAid GinkoVital - Ginkgo Biloba - 30 Capsules by bodykind customers. If you have tried this product we'd love to hear what you think so please leave a review. HealthAid GinkoVital 5000mg helps to maintain healthy blood circulation to the brain and the rest of the body.